Since WKWebView doesn’t yet show up as a drag-and-droppable view in Interface Builder, and other IB work-arounds cause the app to crash, a WKWebView instance is created in the ViewController’s viewDidLoad method. The WKWebView instance is then sized to fill the entire view of the device. This can cause usability problems since the WKWebView’s content now overlaps the header bar. If I was creating an app to ship, I would use Interface Builder to add a UIView, create an IBOutlet to that view, and size the UIView to fit the display portion of the screen. I would then add the WKWebView to the UIView I added using Interface Builder. In order to create the WKWebView and add it to the main view in viewDidLoad and later use the same WKWebView in userContentController:didReceiveScriptMessage method a WKWebView property called theWebView is added to the ViewController class. One of the very nice features of WKWebKit framework is that the WKWebView runs independently of the main, or User Interface, thread. This keeps our apps responsive to user input. The storeAndShow method will not execute in the app's main thread. Overall I am really pleased with the new WKWebView and the other classes in the WKWebView framework when it is compared to the old UIWebView. I like the WKWebView executing outside the main thread. I like the choice of JSON for the data transfer protocol. The adding of the message handlers is a little awkward, but nothing is ever perfect. When you try to run this “should work but doesn’t code” the screen on your device will be blank. There is a scrollbar that you can move but the page is never displayed. This code does work on a device when written in Swift if you move all of the web components to the app’s temp directory before you build the NSURL. For the work-around we’ll do the same thing in Objective-C. I’ve written a small Objective-C class called WebMover to do that for you. It will move web files and any of you app’s web directories for you. When it does the move it will return the path to the index.html file to you so you can use it to create a NSURL. I won’t cover that code in this posting. You can get WebMover’s source and an example project from my gitHub ObjectivelyHybrid repo. I have tracked down one of the issues that causes Objective-C to fail to load the page, even when the web files have been copied to the app’s temp directory. The problem is with this line of code. If this line of code is executed, a NSURL is generated and appears to be good in all observable respects. The NSURL is defective. If the same line of code is executed in Swift, the defect disappears. Because of this, the work-around will generate the NSURL in Swift, but the rest of the code will remain Objective-C. The working viewDidLoad method now looks like this. //modify the array of file types to fit the web file types your app uses. //this is an Objective-C call to some Swift code. The thing I like about this work-around is how close it is to the original “should work” solution. Unlike others who have suggested highly complicated things like building a web server into your app. The SwiftlyBridge Code is also tiny. 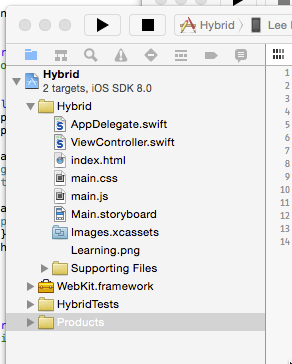 In the example project you can find it in the SwiftlyBridge.swift file. When you add this file to your project, Xcode will ask you if you want it to create a bridging header file. The answer is an emphatic YES. Make sure you have it do this for you. Once you’ve added the WebMover.m and .h files and the SwiftlyBridge.swift file maker SURE that you attempt to build your project. It will fail, but the build process will generate a .h, header, file for you that will allow you to import the SwiftlyBridge class. In the example project this generated header file is imported in to the view controller source, you can compile and run. I’ve had trouble with projects that have spaces or dashes in there names. In those cases Xcode doesn’t seem to be able to find the generated header file. That should do it. Post if you are having issues. Edit: Since originally writing this post I have Created the SwiftlyHybrid and AndyHybrid libraries and put them on gitHub. If you are interested in the topic discussed here I would suggest also reading the SwiftlyHybrid and AndyHybrid follow up posting. In the view controller’s userContentController method we’ll need to have access to the WKWebView created in the viewDidLoad method. This requires the addition of a WKWebView attribute to the ViewController class. After trying a couple of experimental ideas I remembered the correct, Swifty way to do this. I couldn’t create the WebView on the same line as the attribute was declared since the initializer for the WKWebView isn’t as simple as adding some integer attribute (var someInt = 3). Instead the initializer needs a frame and a WKWebViewConfiguration. Because of this the WKWebView must be initialized in the viewDidLoad method (This may change if Apple adds a WKWebView to Interface Builder). The Swift way to declare an attribute and initialize it in something other than an init method is to make the attribute optional using the ? operator. In the viewDidLoad method the WKWebView can now be created using the WKWebView function. Once theWebView has been set, the ! operator is needed to declare that we know theWebView attribute is not nil. My doctoral degree is now done. I could begin supporting that code set again but it would be better to implement it in Swift or current Objective-C and gain access to the new WebKit API common to both iOS 8 and OS X Yosemite. Another reason to ‘start from scratch’ is that the new WKWebView is much more powerful that the old UIWebView. According to Apple, it has all the new HTML 5 abilities and now the same webkit engine as Safari so tools like QC Hybrid, PhoneGap, and the other hybrid tools are not needed by the vast majority of Hybrid developers. That was not true in the past. Never the less, I maintain that this type of project should, in most cases, be a temporary and stop-gap solution while you develop your app in the native languages of the platform. At least for now. With all that history out of the way, lets get to a Swift code example. You can see I have a file called index.html. This is the file that the example code is going to load and trigger the loading of the main.css and main.js files just like any normal web page. In the project’s ViewController.viewDidLoad() method I inserted added code to create a WKWebView, load index.html, and add the WKWebView to the main view. The reason I started the load before adding the web view was to get a little buffering going on before the display. The web view will load without being displayed. I have just posted the 1.6.4 version of QC on SourceForge. It includes some defect fixes and some minor additions, and a few big changes. QC 1.6.4 requires the iOS 4.2 SDK. The big changes are regarding the native application templates. You can now use the same design to create Objective-C iPhone, iPad, and Universal iPhone/iPad apps that you have been using to create your hybrid applications. These native iOS apps come ‘pre-threaded’. Every time you call handleRequest your command stack is executed on a worker thread. Any of your ViewControlObjects that you create for your control Stack are executed in the main thread since it is the only one that is allowed to update the User Interface. All other behavior is done on a worker thread and you don’t have to worry about how to set it up, make it go, or make it stop. Just as with the hybrid apps you’ve been creating with QC all of your async calls to HTTP servers, portals, etc. are linearized for you. You never need to write another callback function! In addition to making your remote HTTP calls easier all of the templates for native QuickConnect applications also include support for both direct SQLite access and CoreData. With a little time working in Interface Builder and putting together some CoreData objects your app is up and running. Examples are already in the download for all of these native iOS templates. Check them out and see how easy native iOS apps can be. The next release will have native multi-threaded Android applications as well. One other change is that the PHP template has been updated. Take a look at the example in the download. The old in-application map functionality has been commented out in anticipation of Beta 2 which will include the access to the new 3.0 Map API and in-application email. QCiPhone 1.5.0 has just been uploaded to sourceForge. They are saying that it may take about 15 minutes to become visible as the default download for OS X machines. Because of the 3.0 Dashcode changes I have not been able to update the Dashcode examples to the latest QC source. All of the Xcode examples are updated. The release includes examples of how to use the video and audio tags in booth QCiPhone and QCMac applications. QuickConnectMac 1.0 is also included in this release. It allows you to create hybrid applications that run on Mac machines just like you do for the iPhone and iPod touch. QuickConnectPHP 1.0 is another template that can be used on the Mac side. It isn’t used to create hybrid applications but is used to create PHP web applications. Also included, for those interested, is QCErlang 1.0. It is an updated version of an Xcode template for developing erlang applications. It includes auto-completes for most of the commonly used functions. 1. UIWebView no longer ends up with a black background after re-displaying the Default.png file while the page loads. 2. DataAccessObject in-browser database use fixed and updated to new methodology for the retention of which BCF in the stack is to be called next. I have been playing with the video and audio tags in the UIWebView on the iPhone and WebView on the Mac. I tried them in the QT WebView as well on linux. I am pleased to announce that they work great! I have tried it with mp3, mp4, and wmv. All worked on all three platforms. It looks like this is a good way to display videos for your users to play in your hybrid applications. Let’s say you have a video called someCrazyMovie.mp4 that you want to display to your users. On the iPhone or the Mac put it in the Resources group of your Xcode project that uses a UIWebView. Point the UIWebView to a local html file, also in the resources file. In this html file put the following code. When you run your application you will see the first frame of the video used as a representational image. You can play it by clicking it. On the iPhone and iPod touch the movie player launches to play the movie. The tag lets you size it, display or not display the video controls, etc. The audio tag is used much the same way. Because of the confusion over the LPGP license of QuickConnectiPhone it is now available under the MIT license. It is still open source and free to use to create either open or closed, free or for-cost applications. I hope this clears up any licensing issues you may have had. QuickConnect 1.5 Release Candidate 1 now Available! After many setbacks, like a very major hard drive crash and a bug in sourceForge, I have finally been able to release QC 1.5 Release Candidate 1. It is now the default download for the project on sourceForge. A fix that correctly handles all types of URLs such as mailTo, http, https, maps, youtube, etc. not all of the examples have been updated to the latest code set. That will be completed for the final release. If you are willing to volunteer to help with updating the examples please contact me. At the request of a couple of QuickConnectiPhone users I have been playing around with a way to combine native footers and/or headers with the UIWebView and specifically the QuickConnectiPhone framework. I am pleased to say that I have something that should make this easy. As of the next release of QCiPhone you can create native, Objective-C based footers and buttons for the footers. You can also hide and display them and the UIWebView containing your QCiPhone application will be resized so that the footer doesn’t cover any of your display. When you hide the footer the UIWebView expands to fill the space made available by not displaying the footer. Here is a snapshot of the QCiPhone example app without the footer displayed. The native footer example application before the Show Footer button is pressed. Here is the native footer being displayed. The example application after the Show Footer button is pressed. The QCNativeFooter constructor is defined as in this following line of code. A unique identifier for the footer. You can have as many footers as you wish. The color of the desired footer as a string. The iPhone options are ‘black’ and ‘standard’. Standard is blue. A boolean flag indicating if the footer should be semi-transparent. The code to display the footer is seen here. To change buttons being displayed all you need to do is call the QCNativeFooter object’s setButtons method and pass in an array of buttons that you want to replace the old ones. The first code snippet in this posting has an example of this call. These methods and objects are just facades for calls to Objective-C using the QCiPhone framework. A complete description of all of the Objective-C executed for these calls would be to large for a blog posting.